You are here: Elegant Simplicity > News > Last Newsletter of the Year! 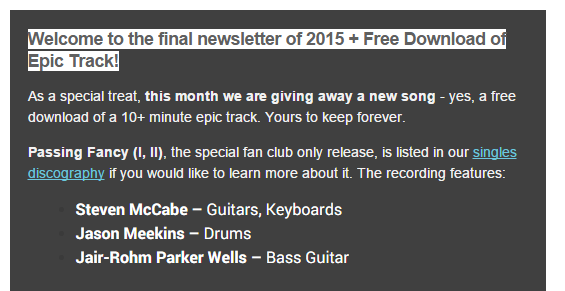 Last Newsletter of the Year! Today, I sent out the last Elegant Simplicity Newsletter of 2015. This is quite a special one as it contains the link to the FREE download of epic track Passing Fancy (I, II) + full details of the new single Love is Transferred (Single Edit), which comes complete with another new song, the hard rocking Southbound Static! As well as the above, there is a brief look at next years plans AND our annual Holiday Sale Discount Code (see next post for full details!). All in all, a pretty packed newsletter. Remember, if you want to hear Passing Fancy (and you really should, it’s great! ), then sign up for our newsletter (see box opposite) and treat yourself! Passing Fancy (I, II), Coming Friday to Subscribers Only!